It was a proud day in the British Empire, but of all its millions, the one who perhaps had the most reason to be proud, was denied by Court etiquette the joy of witnessing the triumphal event. At Sandringham Palace, Queen Mother Alexandra, who, forty-six years ago this month, gave Britain a King, awaited the news that her son had taken his place in the long line of British Monarchs. LONDON, June 22. King George V, Eighth of the House of Hanover, was today crowned King of the British Empire and given the public homage of his world-wide subjects. With his consort, Queen Mary, his Majesty was crowned in the Abbey of Westminster with all the wealth of religious rites and Royal ceremonial prescribed by custom. The picture within the gray-walled Abbey was one of medieval splendor. The coronation services, solemn and imposing, were those handed down from the earlier centuries, and the actors in the principal and secondary roles of today's great function were garbed in reproductions of the multicolored, gold-embroidered trappings worn by their ancestors. The latter made a wonderfully effective setting around the central figures. Outside, the usually dull streets had been transformed into a mass of color. 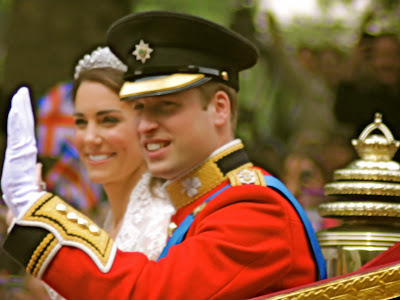 The King and Queen's progress to the Abbey and the route to Buckingham Palace was one unbroken ovation. The route was hedged with a vast ployglot host with a background of gaily decorated viewing stands and windows and roofs, all of which were crammed to their capacity. The pressure of the crowds was so intense at many points, that the police cordon was broken and the aid of troops was required to restore order. When dawn broke the skies were heavy and showers fell during the progress of the processions of the Royal guests and the junior members of the Royal family to the Abbey; but as the King and Queen left Buckingham Palace to be crowned, the heavens smiled and a flood of sunshine brightened the splendid pageant. It was a proud day in the British Empire, but of all its millions, the one who perhaps had the most reason to be proud, was denied by Court etiquette the joy of witnessing the triumphal event. At Sandringham Palace, Queen Mother Alexandra, who, forty-six years ago this month, gave Britain a King, awaited the news that her son had taken his place in the long line of British Monarchs.